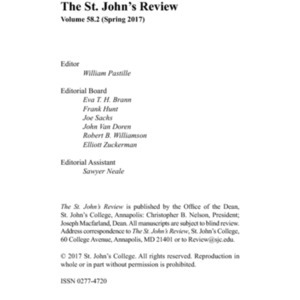 Volume 60, Numbers 1 and 2 of The St. John's Review. Published in Fall 2018-Spring 2019. 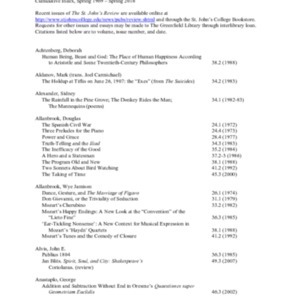 Volume 59, Numbers 1-2 of the The St. John's Review. Published in Fall 2017-Spring 2018. 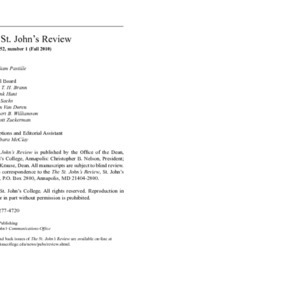 Volume 58, Number 2 of the The St. John's Review. Published in Spring 2017. 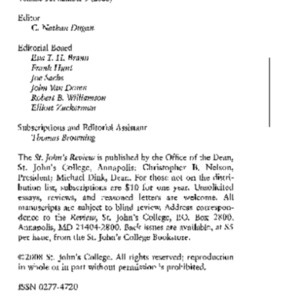 Volume 58, Number 1 of the The St. John's Review. Published in Fall 2016. Volume 57, Number 2 of the The St. John's Review. Published in Spring 2016. 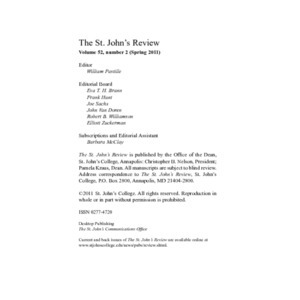 Cumulative index of the St. John's Review publication. Entries are organized alphabetically by author's last name. Volume 57, Number 1 of the The St. John's Review. Published in Fall 2015. 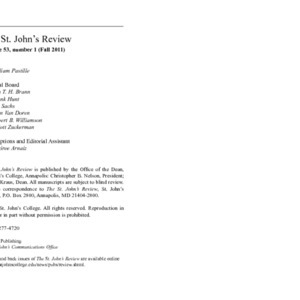 Volume 56, Number 2 of the The St. John's Review. Published in Spring 2015. Volume 56, Number 1 of the The St. John's Review. Published in Fall 2014. 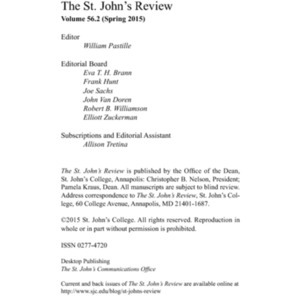 Volume 55, Number 2 of the The St. John's Review. Published in Spring 2014. 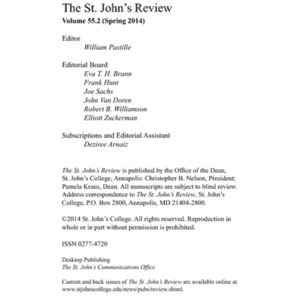 Volume 54, Number 2 of the The St. John's Review. Published in Spring 2013. 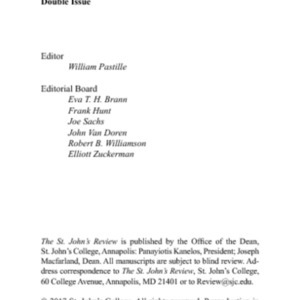 Volume 55, Number 1 of the The St. John's Review. Published in Fall 2013. 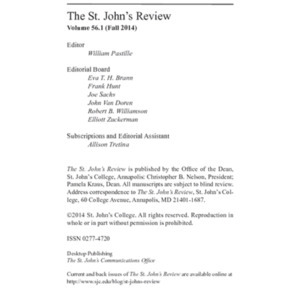 Volume 53, Number 2 of the The St. John's Review. Published in Spring 2012. 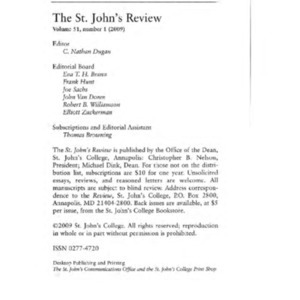 Volume 54, Number 1 of the The St. John's Review. Published in Fall 2012. Volume 52, Number 2 of the The St. John's Review. Published in Spring 2011. 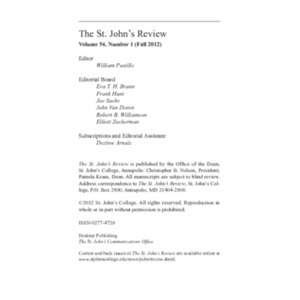 Volume 53, Number 1 of the The St. John's Review. Published in Fall 2011. 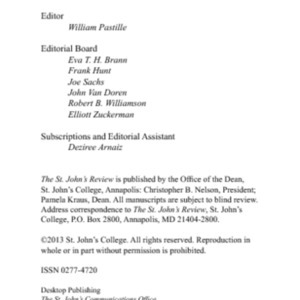 Volume 52, Number 1 of the The St. John's Review. Published in Fall 2010. 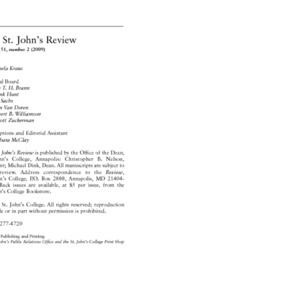 Volume 51, number 2 of The St. John's Review. Published in 2009. 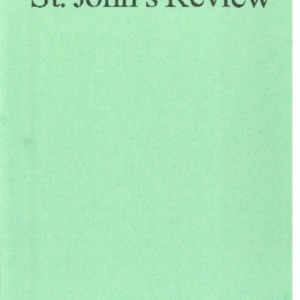 Volume 51, number 1 of The St. John's Review. Published in 2009. 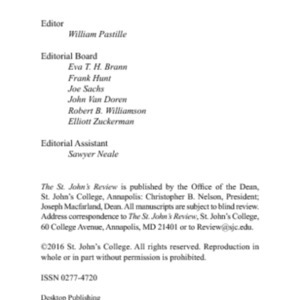 Volume 50, number 3 of The St. John's Review. Published in 2008.